Although I had previously posted this, I made this again and wanted to show it to you once more. 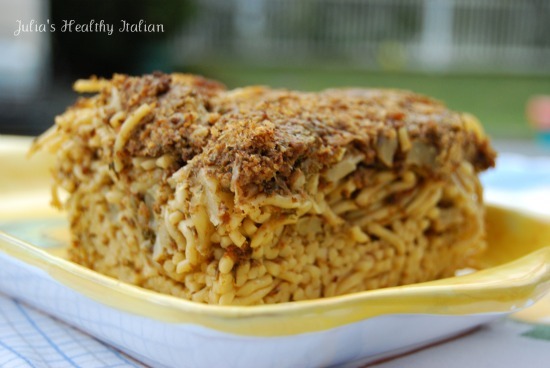 This is a great dish for Christmas eve, as it has sardines in it. My family upholds the feast of seven fiche on Christmas, so this counts as 1 of our 7 fish dishes. Heat a frying pan on medium heat and add a tablespoon olive oil. Toast breadcrumbs until golden, careful not to burn. Set aside. Sauté onions and anchovies in oil on medium heat until anchovies melt and onions are golden, about 5 minutes. Add tomato sauce and pasta con sarde seasoning and simmer another 5 minutes. Add cooked cauliflower, chicken bouillion and pepper to taste and cook an additional 5 minutes. While the sauce simmers, cook the pasta according to package directions. When pasta is cooked, drain and toss into seasoning and mix well. Place in serving bowl with breadcrumbs sprinkled over pasta and serve. This looks great, what else do you all make for 7 fishes? I guess I should post 6 more fish recipes before Christmas! I make fried calamari, shrimps oregonata, pasta with shrimps mussels and scallops in a spicy red sauce and others to name a few. I started a new firm last week and it's been a lil crazy round here! Thank you for sharing this traditional Sicilian dish. Some could enjoy this for the holidays or as a great dinner. Thanks for this recipe for pasta Milanese. It sounds like a wonderful dish.